A violent psychological thriller about two sisters, reunited by a school shooting having grown apart in the wake of a terrifying home invasion twenty-eight years previous that left their mother dead. ...what had been mainly a novel about a fractious family and the sources of its pain turns into a riveting legal thriller. The plot twists here are satisfyingly surprising and plausible, but it’s Slaughter’s prodigious gifts of characterization that make her stand out among thriller writers ... Slaughter’s satirical touches are as deft as her grimmer renditions of real life ... Some readers may find that at 500 pages The Good Daughter is a little longer than it needs to be (Is it mean to fat-shame a novel? ), but if I were to attempt to pare it down, I don’t know where I would start. Sleekness has its virtues but in Slaughter’s big tome neither does there seem to be a word wasted, which is quite a feat. Slaughter brilliantly alternates chapters between time periods and perspectives, methodically doling out crucial pieces of information that often shatter long-held assumptions (and the inevitable resentments that accompany those beliefs). Not only does this serve to balance the tension of both storylines, which are grounded as much in emotion as they are in action, but it keeps her characters—and her readers—in a constant state of unrest. The author’s endgame is at once surprising and satisfying, and you can’t help but marvel at the precision of her plotting. The pain of it all is pervasive but also utterly profound—and, at times, poetic. 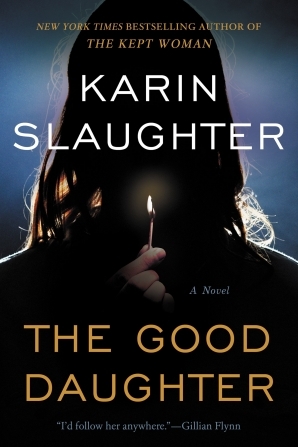 The Good Daughter is a stunning work of psychological suspense that will undoubtedly, and deservedly, rank among the year’s very best (crime) novels. Karin Slaughter has an inimitable style that lends itself to complete immersion, and the absolute sense of realism that she captures within her narrative is both awe-inspiring and gut-wrenching. This one will break your heart a million times over and then put the pieces back together again—or at least some of them. While the themes in this book suggest the content will be dark, readers should brace themselves for some very graphic scenes that aren’t for the faint of heart. Slaughter doesn’t hold back when describing a scene, which makes for a chilling display of violence. Also, this is no police procedural or legal thriller. The Good Daughter is a character-driven story, one that is both highly emotional and highly entertaining. The Quinn family’s many issues reveal themselves slowly, making Slaughter’s latest character-driven stand-alone novel a dark and gritty adventure that’s skillfully plotted and supremely written. What did you think of The Good Daughter?